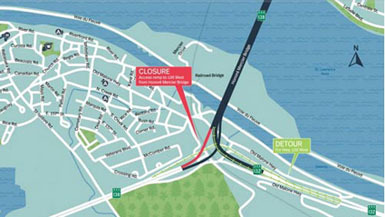 The Mohawk Council of Kahnawà:ke has been informed by the Jacques Cartier & Champlain Bridges Incorporated of ramp closures on the Mercier Bridge over the next two days. Route 138 down-ramp (toward Châteauguay). Detour via the Route 132 down-ramp (toward La Prairie). The up-ramps from the 132 West and 138 East towards Montreal will remain open. Route 132 down-ramp (toward La Prairie). 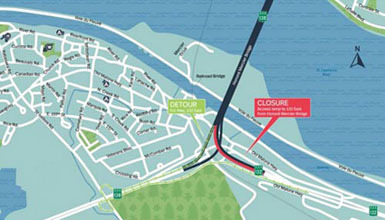 Detour via the Route 138 down-ramp (toward Chateauguay). The up-ramps from the 132 West and 138 East towards Montreal will remain open.